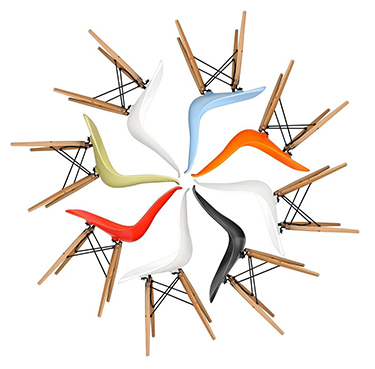 The iconic Charles Eames DAW Chair in moulded fibreglass, plastic or fully upholstered is among the most iconic designs of the mid century. Expertly crafted from a single piece of fibreglass, plastic or cashmere, the Charles Eames DAW Chair features an organically shaped shell that follows the contours of the body. This offers optimal comfort, which is further enhanced by the addition of the armrests. The Charles Eames DAW Chair is available in a variety of colours and is now also available with classic stained walnut legs. It is created in the Eiffel Tower style, which is characteristic of many Charles Eames designs. This gives you the opportunity to find the perfect look for your home, or mix and match colours for maximum effect. The Charles Eames DAW Chair is one of a series of chairs designed by Charles Eames in 1948 for the Museum of Modern Art's Low-Cost Furniture Design competition. The original has the honour of being the first ever mass-produced plastic chair. The Charles Eames DAW Chair 's combination of comfort, durability and style has made it a popular choice for almost everywhere, from dining rooms to playrooms, offices to libraries. The name, DAW, is a reference to the attributes of the chair – Dining Chair with Armrests and Wooden legs. Charles Eames was an American designer and innovator who pioneered new techniques, such as the fibreglass and plastic resin moulding and wire mesh frames. He usually worked alongside his wife, Ray, though he is often credited alone. In the 1940s, the designers began focusing on the new plastics and were excited by the properties the material held. They were able to mould the plastics into organic shapes that followed the shape of the body. This discovery led to a whole new look in furniture that perfectly captured the spirit of the times. The couple’s most iconic designs include the DAR chair, the DSR Dining Chair, the RAR Rocker, the DSW Dining Chair, the EA 108 Office Chair and the Wire Base Table. Many of these were first presented at the New York Museum of Modern Art’s Low-Cost Furniture Design Competition in the late 1940s.